You probably have heard that keeping an existing customer is way easier and more cost-savvy than attracting a new one. But did you know that existing customers tend to spend 67% more than new customers? Customer loyalty is customer’s belief that certain brand or company has the best offers for him. It’s a truly valuable company asset that helps retaining more customers, as well as expanding your relationships with them. What is often overlooked in customer loyalty is the emotional connection customer has with a brand. Loyalty is the result of a consistent positive emotional experience that comes along with purchased goods or services. Quite often customer loyalty is confused with customer retention. These are two different yet closely related measurements, each playing a significant part in growing a sustainable business. Customer retention rates identify whether an existing customer continues buying from you or doing business with you. There is a variety of activities and actions a company decides to take in order to encourage repeat purchases. Customer loyalty, on the other hand, measures a customer’s preference for your brand over competitors. Loyal customers are likely to consistently respond favorably toward the brand because of shared values and positive emotional experience with a brand. What is important to understand here is that retained customers are not necessarily loyal customers of your brand or product/service. Customer loyalty management focuses on growing and retaining existing customers by aligning marketing and promotional activities to not only build customer loyalty and trust but also encourage repeat purchases. Let’s take a look at four activities that can help you manage customer loyalty better. Once again, content marketing. By creating and sharing valuable and high-quality content with your customers and prospects you are building your credibility as a brand. You are no longer yet another company that aims to boost sales. Instead, you are there to share the knowledge your customers could benefit from. Whatever you decide to create, make it easily accessible for anyone who might be interested. And don’t forget to share your knowledge on social media, online communities, groups and forums. Studies show that brands with strong internet presence tend to have more loyal customers than those which fail to maintain visibility through different communication channels used by their customers. However, frequently updating your social media accounts is no longer the only way to prove your presence. Today, answering customer requests, responding to comments and questions or joining viral conversations is far more important. First of all, it proves the customer that you care about their experiences and opinions. And second, your participation or initiation of topical conversations online projects your company values. Why it matters? Because values you and customers share, opens the door for more trusty relationships which can also accelerate loyalty. Customer loyalty has a lot to do with company’s ability to tailor the experience to each individual consumer. At the end of the day, positive emotional experience with a brand is one of the main factors that keep bringing your customer back. 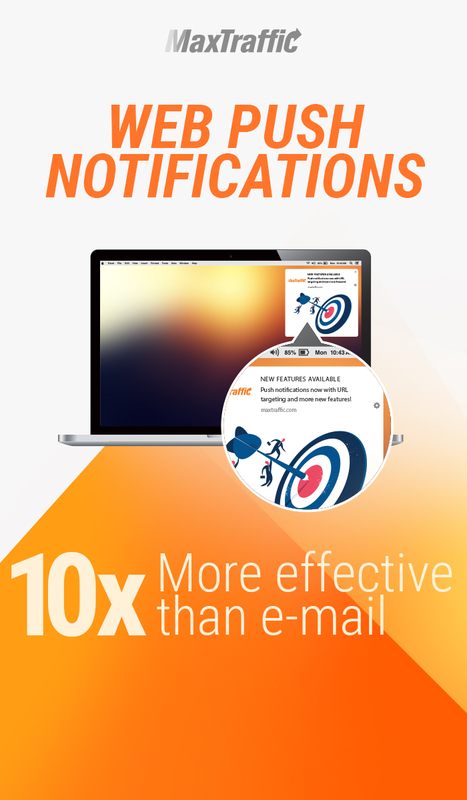 That’s why you want every bit of your marketing efforts from email and web push notification campaigns to landing pages and ads carefully personalized. Congratulate your customer on a birthday, remind him about abandoned carts or put together a product recommendation that is truly relevant to his interest. You can do all of this and more by collecting data about your customers and their behavior on your website and later analyzing it, to create automated marketing campaigns that will boost not only conversions but also customer loyalty. I’m not the first, nor the last one to say to you that customer service needs to be taken seriously. And not just for all the obvious reasons. The way you deal with customer related matters shows them what you really are like. And that can help gain or lose customer loyalty and trust. That’s why you want to be basing communication with your customers on integrity. To achieve that you have to offer a consistent level of service, work on proving your reliability and most importantly, keep your words. Customer loyalty programs can be a great help in increasing customer retention as well as nurturing relationships with them. However, having a loyalty program doesn’t on its own mean that your customers will instantly become loyal. In fact, creating and maintaining a successful customer loyalty program can be quite a task. how well you know what customer values (what to offer). There are quite a few customer loyalty programs out there. And here are four most popular ones that might work for your online business too. Point program is the most popular customer loyalty program that let customers earn points. Usually, the amount of collected points is tied to money transactions. For example, a pharmacy chain in the United Kingdom Boots encourages customers to get their advantage card and earn 4 points for every pound spent. However, recently more and more companies are also offering points to the customers who bring more business by recommending their product or service to others. With this customer loyalty program, customers can redeem their collected points for rewards or free products or services. In spend programs, customers get loyalty credit for the amount they spend at your store. Most commonly businesses offer cash-back reward. It’s easy to understand for the customers and easy to create and maintain for the company. The scenario of spending loyalty programs is simple. A company gives X% of the amount customers spent back to his account or loyalty card. A customer can later use this money to partially or fully pay for that company’s goods or services. Customer loyalty program like this can help not only cut your churn rate but increase the number of transactions as well as amounts of it. With paid loyalty programs, members are paying a monthly or yearly fee to access exclusive discounts, services or unique opportunities. Programs like this are a great way to draw more customers further into your marketing funnel, encouraging even more purchases. You probably have heard about Amazon Prime. For a yearly fee of $99, program members get free two-day shipping on almost any item on Amazon. Not to mention the unlimited access to video, music and e-book catalogs that comes with prime membership. Paid program members tend to spend more than non-member shoppers. But of course, the success of such loyalty program comes down to a company being able to offer a truly valuable service for which customers would be willing to pay extra. Tiered customer loyalty programs give customers special rewards based on different levels of spending or collected points. Essentially, the more customer spends on your business, the higher he climbs up the loyalty program ladder. And with that come more benefits or exclusive services which customer can take the advantage of. Tier customer loyalty programs are common amongst airlines. Travelers who join the program can move up a tier by traveling long distances or taking a certain number of flights. In loyalty programs like this, customers are offered not only gifts, free products or services, but also different privileges. If you are now wondering which loyalty program suits your business the best, don’t rush. The truth is, not every business needs programs like this, especially if it’s offering unique products or services. Positively communicate value proposition of your product or services to your first-time customers and chances are they will be loyal because what you have to offer is one of a kind. A perfect example of that is Apple. Even the biggest followers of the brand don’t get to enjoy special discounts or rewards. Why? Because every customer has gets the same benefits from the brand – a qualitative product and positive customer experience. Whether you are running loyalty program or not you still need to be measuring the strength of your relationship with customers. Doing that gives you a great chance to understand what aspects of your customer loyalty management could be improved. Net promoter score, or NPS, is used to identify what percentage of your customers is likely to positively recommend your business to others. This score is calculated by conveying a customer survey with one simple question: how likely are you to recommend us? The respondents, your customers, are expected to indicate their willingness to speak about your brand to others on a scale from 1 to 10. Customers who answer with a 9 or 10 are considered promoters. Those who respond with 7 or 8 are passive, and anyone answering with a 6 and under is considered as a detractor. The final NPS is calculated by subtracting the number of promoters (%) from the number of detectors (%). Repeat purchase rate takes into account the purchases from repeat customers divided by all purchases on the site for a given date range. The calculation results range from 0% to 100% with the higher the number the better. Even though a customer who has purchased from you more than once cannot be instantly called a loyal customer, the odds that he favors your brand over others is higher comparing to single time shoppers. Repeat purchase rate (RPR) can help your business understand how likely your customers are to return after their first purchase. This knowledge can later on used to inspire future marketing campaigns to increase the number of returning shoppers. If you want to measure customer loyalty improvement over a certain period of time, customer lifetime value (CLV) is a metric you want to be following. CLV measures how often customer shops on your store and how long they remain a customer. In other words, it can help you determine whether your customers are becoming more loyal over time. There are a number of ways you can calculate customer lifetime value. However, the most basic way to do that is to add up the revenue you’ve earned from a customer (annual revenue multiplied by the average customer lifespan) minus the initial cost of acquiring them. The following two ways to measure customer loyalty are particularly useful for businesses that have loyalty programs of some kind up and running. As the name suggests, customer participation rate helps the business understand how many customers are participating in your loyalty program. Needless to say, it’s a great way to track the growth of it. To calculate customer participation rate all you need to do is divide a total number of customers by the number of program members you currently have. The higher the percentage is the better. Last but not least, you need to be measuring redemption rate. It’s a proportion of all the awarded points or coupons that are eventually used. Redemption rate indicates to what degree your customers are engaged with your loyalty program. This allows you to draw conclusions whether the program needs significant improvements. Based on analysis of 15,000 online stores, the average redemption rate in e-commerce is 13%. Anything around 1% is considered low, and 32% or more is a high redemption rate. Customer loyalty plays an important role in the overall success of a company. That’s why, whether your business is big or small, it’s important to think how you can strengthen relationships with your customers and inspire their loyalty. Needless to say, if you manage to build a close bond with your current customers, you can expect a significant increase in sales revenues too.